1. Cube the fish and place in a food processor with the prawns and a pinch of salt. Pulse until minced but not too smooth. 2. Chop half the coriander and mix into the fish with the curry paste. Shape into 8 even-sized cakes. 3. Spritz a non-stick frying pan with sunflower oil, and cook the cakes for 4 minutes on each side until golden and cooked through. Meanwhile, halve the baby corn and sugar snap peas lengthways. 4. Spray a wok with sunflower oil and stir-fry all the vegetables for 2 minutes. Add the noodles and stir-fry for a further 2 minutes until piping hot. 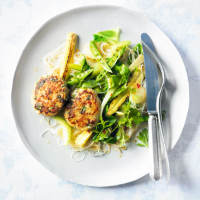 Toss with the dressing and serve with the fishcakes and reserved coriander leaves.